July 16, 2015 marks the 458th anniversary of Anna von Kleve’s death. So who was this woman, who could call on none other than a queen of England to act as executrix of her will? More commonly known as Anne of Cleves or the fourth wife of Henry VIII, Anna von Jülich-Kleve-Berg was born on September 20, 1515 in Düsseldorf to Johann III von Jülich-Kleve-Berg and his wife Maria von Berg; Anna was their second daughter. Anna was given an old-fashioned education, with an emphasis on domestic skills. Johann III was known during his reign as Johann the Peaceful. Johann held a close rapport with Erasmus of Rotterdam, even giving Erasmus a pension in April of 1533. As religious reform was creeping through the various Germanic duchies, Johann sought to preserve tolerance within his borders by creating church regulations. Johann worked closely with Erasmus in creating the church regulations that were decreed in 1533. In February 1538, Johann, originally Johann the Peaceful, died being known as Johann the Peace-Maker. Anna was raised mostly by her mother, Maria von Berg, with whom Anna enjoyed a close relationship. Maria, a strong-willed woman, was a devout Catholic. Between Anna being raised by her Catholic mother and Anna’s father holding Erasmus, and not Martin Luther, in close confidence, it was likely that Anna was at least raised as a Catholic. Due to Anna’s upbringing, close relationship with Mary I of England and Anna’s Catholic funeral, it is certainly conceivable that Anna was not a Protestant. She went on to learn English with shocking alacrity. Anna, although a bit sheltered, was a sharp young woman. German women’s fashion was wildly different than English, Spanish, Italian, and French fashion of the time. Anna’s traditional German clothing was viewed as quite cumbersome when compared with English clothing. The dress Anna wears in the famous Holbein portrait has intricate embroidery, lavish, puffed sleeves, a high collar, and jewels. Her hood in the portrait is quite elaborate, as well. To a foreigner from a place outside of Kleve, Anna’s style could be seen as inordinate, rather than luxurious, which could affect the perception of Anna’s appearance. Sybille (1512-1554), Anna’s older sister, married Johann Friedrich, who was the Elector of Saxony. Johann Friedrich was also a member of the powerful Schmalkaldic League, which boasted of Germanic princes, counts, the French and Danish kings, almost thirty Imperial and Hanseatic cities, and over forty Protestant theologians, imperial envoys, and the Pope attending the Schmalkaldic federal assembly which took place in winter 1537. Anna’s younger brother, Wilhelm V (1516-1592), married the Holy Roman Emperor’s niece, Maria of Austria. Anna’s younger sister Amalia (1517-1586) has been described as having a strong personality; she went on to write poetry at the least and draft an entire songbook at most. All of Anna’s siblings went on to either have brilliant marriages, be part of successful kingdoms or duchies, or contribute to Germanic culture and literature. So, who was Anna von Kleve? She was a wonderfully intelligent, witty woman. She wore extravagant clothes and enjoyed a close relationship with her mother. Anna was the daughter, sister, and wife of powerful European rulers. She was a catholic. 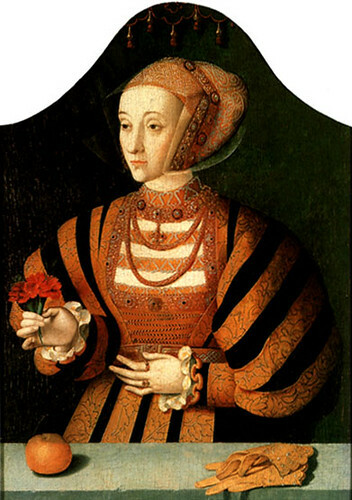 She was polite, savvy and a true gentlewoman, with a French ambassador stating that, “…[All of Anna’s] affairs could never make her utter a word by which one might suppose that she was discontented.’” From her birth until her death, Anna was a remarkable Daughter of Cleves. “Anne of Cleves: Facts, Information, Biography & Portraits.” Accessed July 14, 2015. http://englishhistory.net/tudor/monarchs/anne-of-cleves/. Strikland, Agnès. Lives of the Queens of England. Vol. III. (London: Longman, Brown, Green, Longman, & Roberts 1857). 94. “Anne of Cleves: God Send Me Well to Keep.” Accessed July 14, 2015. http://tudorhistory.org/cleves/ See also, “Anne of Cleves: Facts, Information, Biography & Portraits.” Accessed July 14, 2015. http://englishhistory.net/tudor/monarchs/anne-of-cleves/. Withof, Johann Hildebrand. Chronik der Stadt Duisburg von Anfängen bis zum Jahre 1742. (Herstellung und Verlag: Books on Demand GmbH, Nordestedt; Albrecht Blank 2008). 196, footnote 276. “Johann III. Der Friedfertige.” Accessed July 15, 2015. http://www.hagen-bobzin.de/hobby/Johann_III_1539.html. Norton, Elizabeth. Anne of Cleves: Henry VIII’s Discarded Bride. (Gloucestershire: Amberly Publishing, The Hill, Stroud 2010). 11. Norton, Elizabeth. Anne of Cleves: Henry VIII’s Discarded Bride. (Gloucestershire: Amberly Publishing, The Hill, Stroud 2010). 11. See also, “Johann III. Der Friedfertige.” Accessed July 15, 2015. http://www.hagen-bobzin.de/hobby/Johann_III_1539.html. Norton, Elizabeth. Anne of Cleves: Henry VIII’s Discarded Bride. (Gloucestershire: Amberly Publishing, The Hill, Stroud 2010). 10-11. Dr. Alfred Woltmann. Holbein and His Times, trans. F. E. Bunnètt (London: Richard Brentley and Son, New Burlington Street,1872), 435-436. This description of Anna is attributed to Nicholas Wotton, in a letter written to Henry VIII concerning Wotton’s perception of Anna. “Anne of Cleves: Facts, Information, Biography & Portraits.” Accessed July 15, 2015. http://englishhistory.net/tudor/monarchs/anne-of-cleves/. Norton, Elizabeth. Anne of Cleves: Henry VIII’s Discarded Bride. (Gloucestershire: Amberly Publishing, The Hill, Stroud 2010). 131. ‹ Welcome to Maidens and Manuscripts!